How much of your repurposing process can be hands-off? At Content 10x we provide a custom personalised service where we repurpose our clients content into new and creative formats whilst making it suitable for each platform that they want to build a presence on. But what if you want to repurpose your videos and podcasts but you don’t have the budget to hire help, and you don’t have the time and/or skillset to do it yourself? What if what you really want to do is simply syndicate your podcasts or livestreams to a variety of platforms without editing the content? What if there was a tool that could do this for you automatically? Well, there is! 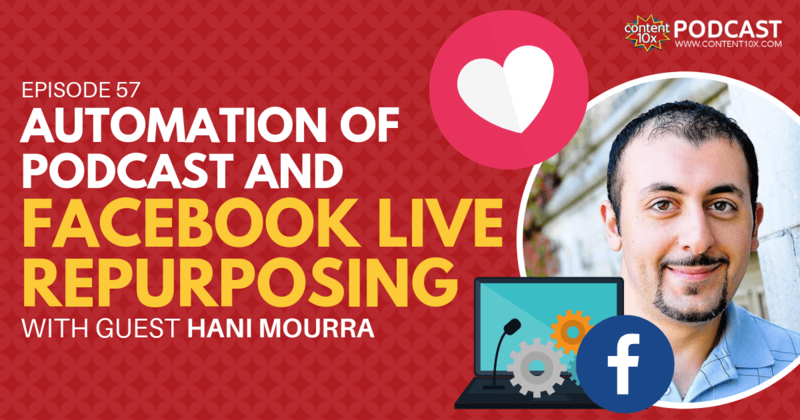 That’s where my guest on the podcast this week, Hani Mourra, and his automated repurposing software come into the picture – Repurpose.io. I met Hani at the Podcast Movement conference in July 2018 in Philadelphia. I was already well aware of Repurpose.io but little did I know that Hani and I had a bunch of mutual friends in the podcasting space. We got introduced to each other almost straight away and had fun hanging out. It was nice to get to know someone who has a mutual love of repurposing content! I thought it would be a great idea to invite Hani onto the podcast. Hani explained that he has always been passionate about video content. He started online with a blog that taught people how to make videos and create content for YouTube. His philosophy is always to keep things as simple as they can be. Being a coder, too, his commitment to simplicity evolved into an idea - could he create software that would automatically repost content to multiple platforms? That idea became Repurpose.io, a web app that syndicates audio or video content to YouTube, Facebook, SoundCloud, Libsyn, iTunes, backup to Google Drive and Dropbox, and more! You can set up a template video image that pulls the title of your podcast and ads a waveform. So podcasts can go automatically to video platforms. It’s a terrific time-saver. 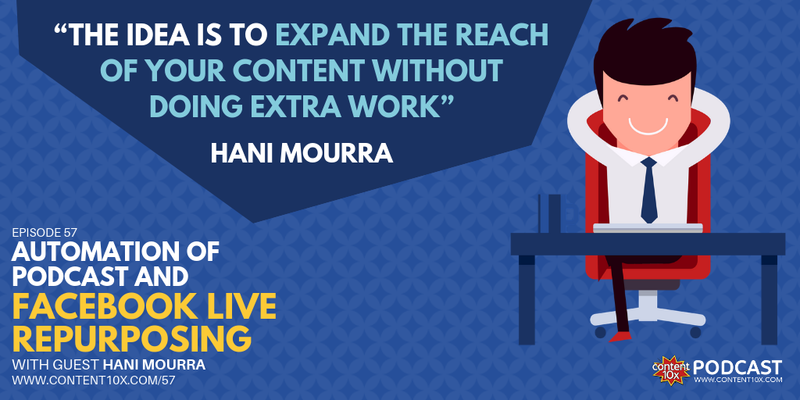 Some of Hani’s happiest users are live-streamers who are all about their communities on Facebook or Youtube. People who know they should be uploading their content as podcasts but were procrastinating on learning the ins-and-outs of doing it. Repurpose.io can do it for them automatically. Why Not Just Stay on One Platform? 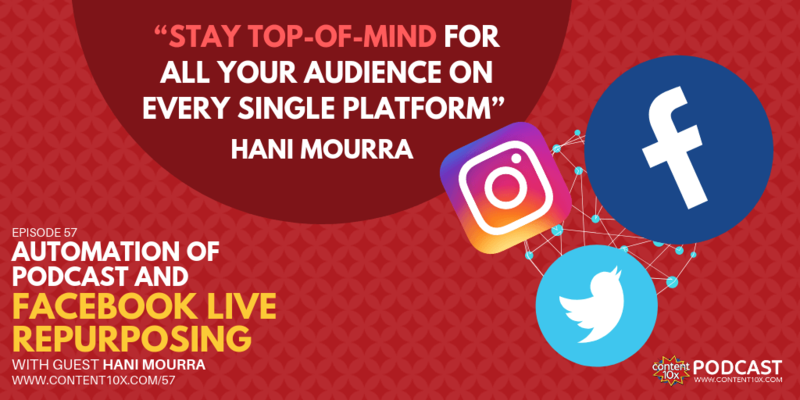 Your audience is going to be the biggest and most vibrant on the platform(s) where you spend the most time and interact the most with the people. As Hani says, your reposted content likely isn’t going to get millions and millions of views, but that’s okay. It’s about being in people’s feeds and staying top-of-mind. I totally agree. The wider your presence, the better. All online platforms treat you better if you give people a way to consume your content without leaving to go to another website, and the users tend to prefer it that way, too. It’s better to upload your YouTube livestream replay to Facebook than to link out to the original video. How Hands-Off Should You Be? Repurpose.io can put podcasters and live-streamers all over the web without the hassle of downloading and reuploading your content. Personally, I love the more hands-on approach. By tweaking your content, you can multiply the impact it has and use it in a conscious content strategy that draws people to your website as well as building your audience natively in the platforms you use. But software like Repurpose.io can make the process much faster and is hugely beneficial to many content creators (especially if you’re just starting out and have a low budget), just like Canva does for creating visuals, Trint does for transcripts, and Wavve does for audiograms. Listen in to this week’s episode to find out more about Hani and Repurpose.io. I’d love to know your thoughts. Have you used this tool before?Have you found other tools that help you with your repurposing efforts? Please do let me know in the comments below or reach out on Instagram, Facebook or Twitter.